LANSING — A collaboration between a 131-year old nonprofit group and University of Michigan students may result in a recycled product that employs Detroit’s homeless. During the Great Depression, members of Cass Community Social Services served hot meals to families in need. More recently, the organization teamed with U of M students to design a product that’s easy to make from recyclable materials. The result: Treads Motor City Sandals, a small business that could employ and support its customers and the jobless in the city. Using old tires and recyclable materials, future employees will follow the method developed by the design students to produce the sandals. The brand is part of the agency’s Green Industries program, a series of small-business, eco-friendly ventures. Using Green Industries as a tool, the organization is finding new ways to help the needy and reduce the city’s ecological footprint. In the past, the organization has designed a workout facility that manually produces electricity and turned old tires into mud mats. Now it wants to take the fashion world by storm, for a good cause. Executive Director Faith Fowler, a U of M University of Michigan alum, highlighted two aspects of the group’s mission: “Number one is to do things that are good for the planet. “The industry part applies to the record highs in unemployment. People have barriers in getting jobs. We employ 65 people in our green industries. We just added two new programs, which have about 10-20 people,” Fowler said. 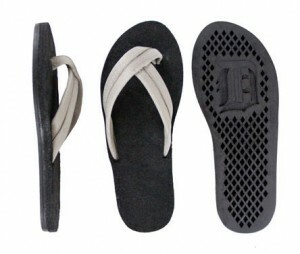 Tian Lian of Katy, Texas, is among six students involved in bringing the sandal idea to life. They had plenty of ideas, but sandals made the most sense, he said. The project didn’t always go smoothly. Working late into the night, the sandals were always coming out right-footed, Lian said. But armed with their diverse backgrounds, the students soon solved that problem. The group is now building the manufacturing line in a warehouse and setting up the molds for the final design. According to the Homeless Action Network of Detroit, about 14,000 people don’t have a home in the metro Detroit area. More than half of the homeless families have children. There is plenty of work ahead for the Cass Community crew. They plan to incorporate geothermal energy into the agency’s buildings, and expansion of shelters and warehouses will includes solar panel to generate energy. Kam Moore writes for Great Lakes Echo. LANSING — Pam Christensen has heard about the demise of libraries for years. The 26-year director of the Peter White Public Library in Marquette said such reports were always greatly exaggerated.